I am not much of a baker. I can make a pretty mean pie or crumble but for some reason when flour is in the mix things seem to go wrong. That is why I say that there is no shame in the boxed mix game. I love brownies and that included box mix brownies. It’s just awesome to be able to crack open a box, add a few ingredients, and in no time you have brownies. This recipe is republished from my archives. It’s one of the first baking recipes I ever posted and it’s still a great recipe. I’m still not a great baker but back when I first made this recipe I was a horrible baker. But, with a box of brownie mix, some raspberry jam, coconut, flour, and butter even I could pretend expert baker. 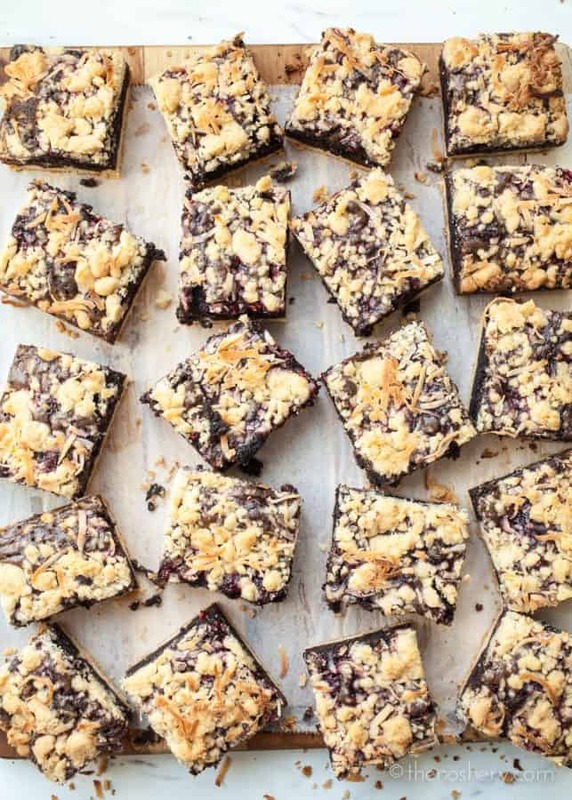 What I love about these brownie bars is the combination of textures. I prepare the brownie mixture so it comes out fudgy and soft. 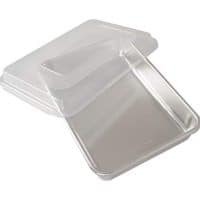 It’s sandwiched between crumbs layers making it easy to enjoy without getting your fingers sticky. I then top them with a little raspberry jam and toasted coconut, classic pairs with chocolate. I love the pairing of chocolate and raspberry but, I especially love the contrast of the fudgy brownie and crisp buttery crumbs. It makes them dangerously addictive. I warn you when you make these be sure you’re taking them somewhere or you are sure to eat them all before the day is done. You know the game. Walk by the pan, take half, walk by again, take another half. Then take a whole bar, then another, and the next thing you know your half way through the pan. So, unless you have the metabolism of a hummingbird enjoy one and get them out of the house. Because they are freaking awesome. It’s a great and easy recipe to keep in your pocket for a quick treat or the next time you’re asked to bring something to a bbq, picnic, or potluck. 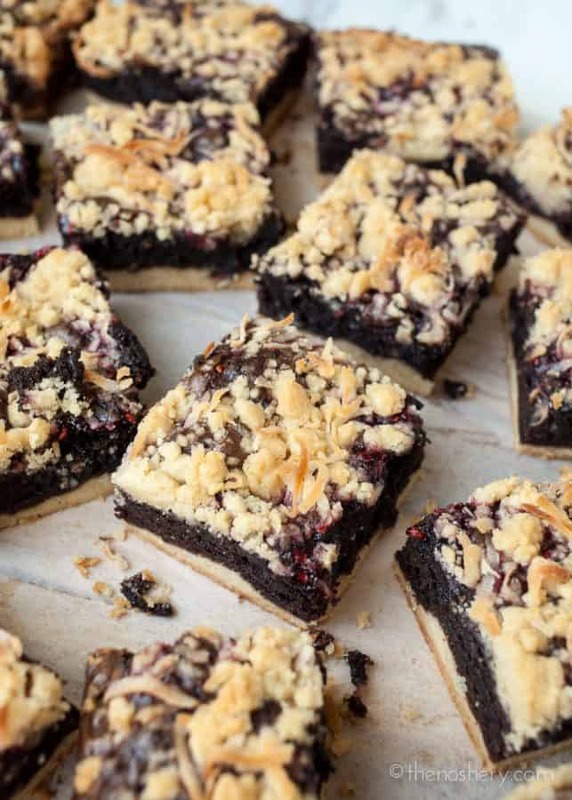 Make boxed brownie mix awesome with some raspberry jam, coconut, and buttery crumbs. Pre-heat oven to 350 degrees. Line 9 x 13 pan with parchment paper, leaving some of the parchment hanging over the sides of the pan. Prepare brownie mixture according to the instructions on the box. Cream 2 sticks of butter, add flour, brown sugar and salt. Beat at a low speed until combined and crumbly. Take 1 3/4 cups of crumbles and place in prepared pan. Press the crumbles, shaping to the bottom of the pan. Pour brownie batter over the crust, set aside. Heat a pot over medium-high heat, add seedless raspberry jam, stir constantly until it melts and you have a nice sauce, set aside. Flour your hands and work the crumb mixture with your fingers, pinching it, until you get good size crumbles. 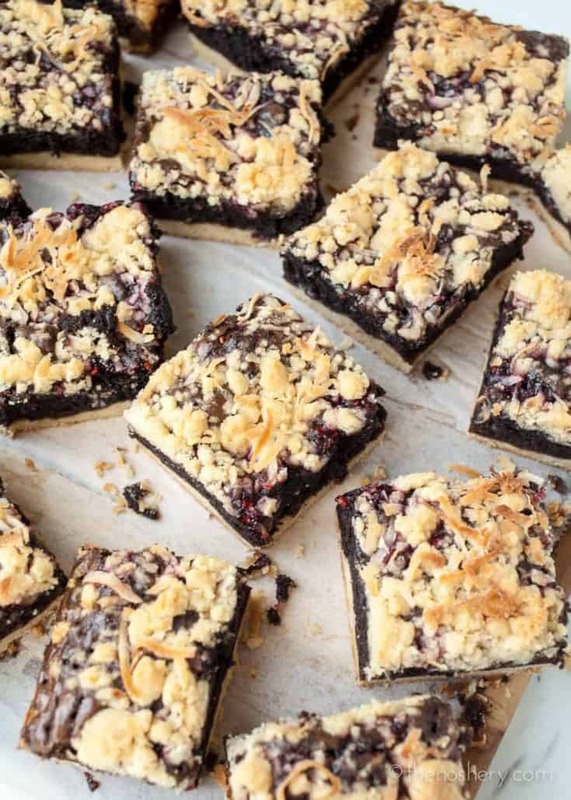 Sprinkle the crumbs over brownie mixture, drizzle raspberry sauce over crumbles and sprinkle on top with coconut. Bake in the oven at 350 degrees for 35-40 minutes, until done. Let cool. 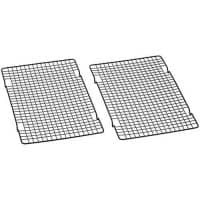 Lift the bars out of the pan with the parchment paper and cut into bars. The last time I posted something, I had not even tried this particular recipie yet, but I was so excited as I had already tried two of your recipies. Yea, yea, yea, you made me a food rockstar!!! Everyone went crazy at our choir breakfast of 80 people and musicians! And there are really good bakers down here in the South, but they were still impressed. Thank you so much for making this one up! It was so much fun to make! I’m sharing it with my mom so she can be a food rockstar too! Although she already is. The only thing I would change is the amount of cookie crumble amount you put for pressing in the pan. I put alot more (maybe my pan was bigger). And that raspberry drizzle-girl-that’s what makes this so unique!!! !Thanks again!!! Oohh, my gooodness! God has blessed you with an amazing talent. Thank you for blessing all of us lower earthlings! Wow those look absolutely fabulous – yum!!! I have these in the oven right now. 10 more minutes and I guarantee that I will be burning my tongue! Mmmmmmm! I would love some of those right now!!! I love the combo of chocolate and raspberries. Thanks for posting this recipe. I’m going to have to make these asap. Wow! This looks divine, raspberries and chocolate were meant to go together. The photos are delicious. These sound so amazingly good! Moist chocolate brownies with raspberry jam and crumbs! The chocolate and raspberry combo is one of my favorites! Brilliant idea! I love dressing up a boxed mix, and this combination sounds amazing. I too have a bag of brownie mix in my pantry, I think you just helped me figure out what to do with it, great looking pictures. I love brownie and crumb anything, what a fantastic combo!!! These look so delicious! Thanks for the step-by-step instructions! These look so decadent! Looks like your baking experiment ended verrrry well. This looks amazingly decadent and delicious! And way to do it Semi-Homemade-Sandra-Lee style, too! Mmmmm, yummy! These look amazing–great way to dress up a box mix! Oh my. I have never seen that crumble technique applied to a brownie. You are an evil evil person.